A new player at JackpotCapital.com online casino has won a large progressive jackpot without wagering a penny of her own money. She won the $14,593 progressive jackpot after placing a bet using the free bonus money she’d received as a new player. “Most online casinos require you to wager many times the amount of your progressive jackpot winnings made from free bonus money before you can withdraw them, but we don’t,” said JackpotCapital.com CEO Oliver Smith “We don’t let our players wait long for their winnings either. Like all our winners, this jackpot winner received her money immediately. And as well we do not deduct the amount of the free bonus before payout, what you will find almost everywhere else." The lucky American player was enjoying one of her first games of Caribbean Stud when she hit the jackpot. JackpotCapital.com offers more than 300 online casino games provided by Real Time Gaming, one of the world’s top casino software developers. The Caribbean Stud jackpot network is one of 12 progressive jackpots offered to JackpotCapital.com players. "Shopping Spree", currently the biggest jackpot, is waiting to pay nearly $900,000 to the next lucky winner. 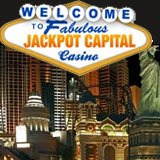 JackpotCapital.com is pleased to welcome players from the United States. New customers receive a 100% Match Up Bonus on their first deposit.